Although I am actually an omnivore by definition, my true passion lies within the flesh of our animal brethren. With that said, I do have friends that dabble in the dark arts of, dare I say it, vegetarianism, and even more blasphemous vegan-ism. Now, as a foodie, I do believe it is paramount to keep an open mind in regards to any and all foodstuffs, but no meat is hard for me to wrap my head around. I would be remiss if I did not inform you, the readers, that I once tried to be a vegetarian, way back in the day. I lasted a total of two weeks in this endeavor and epically failed when I walked into a McDonald’s and succumbed to the temptation of the classic Big Mac. This adventure, although short lived, taught me an interesting lesson about being a vegetarian, vegan, or having any other dietary restriction that one must live with. That lesson was and still is, unless you are preparing all your meals yourself, dietary constraints are tremendously inconvenient for everyone involved. I always remember this factoid, when veggie heads roll through and join us for a meal. There are a few different Blue Moon Café locations and a full list of them can be found on their website, as well as a full menu, and other pertinent information as well. Although we have been to other locations, on this occasion we decided to go to our regular Blue Moon Café in Woodcliff Lake. We did not have to wait for a table, but we did arrive slightly later than usual. On a Friday or Saturday night a short wait is to be expected. As soon as we took our seat a waiter brought over a basket of fresh tortilla chips and a bowl of some of the best salsa that I have ever eaten and took our drink order. The salsa is tangy but not too spicy, just the right amount to get your taste buds bouncing in preparation for the meal to come. I know, most Mexican restaurants offer free chips and salsa as an appetizer, but this salsa is really spectacular and needs to be given the props that it deserves. Most places try to pass a bland, drab, soupy salsa that looks and tastes like it came right out of a five gallon bucket. Blue Moon’s Salsa is anything but, with big chucks or vegetables and a taste that always has is asking for another serving. Unfortunately, this is not a, “bring your own bottle establishment”, which hurts their value score a bit, but they do offer a full bar which will create any cocktail you could wish for. I suggest one of their many specialty margaritas, which are served in a large glass with a decent amount of alcohol and a large amount of flavor. The good news is that although they will charge you per alcoholic drink, the non-alcoholic beverages are endless, which comes in handy after you pour a bunch of hot sauce on your meal and dig in. While chowing down on some tortilla chips, we perused the menu and after some group discussion we all decided on what we should order. Lorin, went with a special from the Burritofest menu called the Santorini Burrito, which was described as a giant burrito stuffed with sautéed fresh spinach, black beans, rice and feta cheese served in a whole wheat tortilla with sour cream or guacamole for $13.95. Ms. Kingsley, decided to dine on the Fajita Moon, which was described as marinated grilled strips of steak with sautéed peppers and onions, sliced avocado, refried beans and Mexican rice all wrapped in a flour tortilla then smothered in melted cheese all for just $16.95. I ordered a burrito that seemed to be calling my name the second I opened the menu, the Triple Play, which was described as steak, shrimp, chicken, black beans, pepper jack cheese, tomatillo sauce, pico de gallo and flour tortillas for $16.95. I could just not say no to the baseball word play as well as the fact that I would be enjoying three different types of protein in one giant burrito. As you were reading the descriptions, I could hear your thoughts of disbelief. As a foodie, I to have been lied to by a menu’s description that promises portions using adjectives that are not quantifiable such as giant, huge, gigantic, or massive, but this is not just another white lie by the Mad Men. 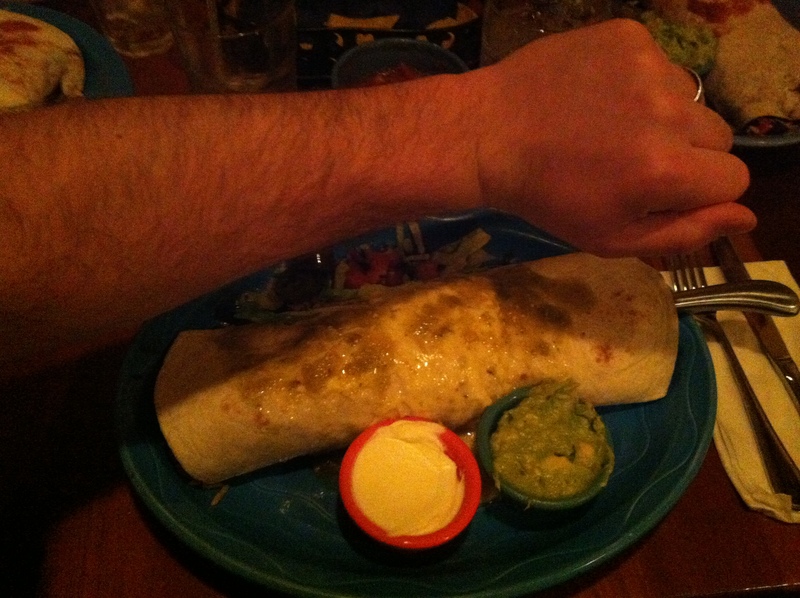 I know this is a cliché, which I really try to use in my writing; The Blue Moon Café serves colossal burritos that are literally the size of my arm. (Seriously look at the attached picture, I am not joking.) Due to this fact, it is very hard for me to order anything else when I eat here. Occasionally, I force myself to switch it up, but if you are going to eat here for the first time, do yourself a favor and make the first thing you try one of their many different burritos, I assure you, you will not be sorry. Our food, took a bit to cook and we ordered more chips and salsa to pass the time, which are free and endless, which is awfully generous of them. 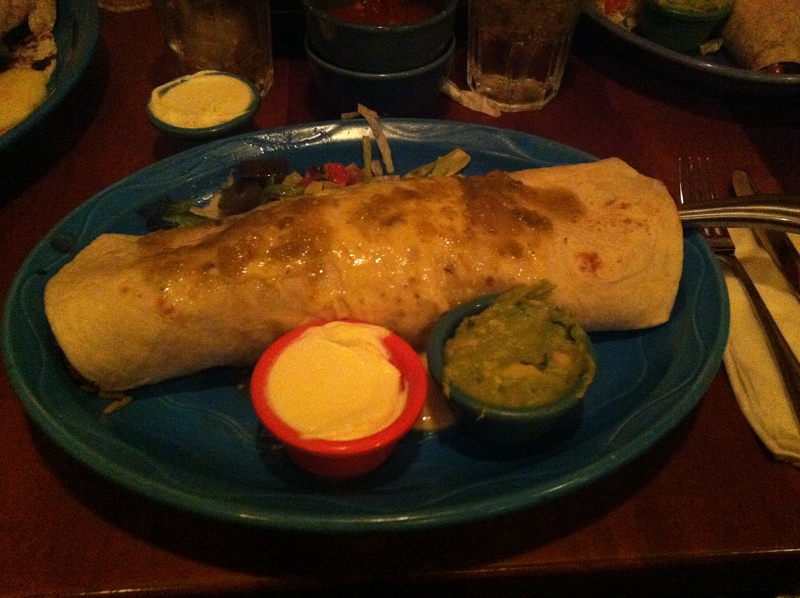 When our food arrived at our table, I was once again, taken aback by the girth of the burritos. Some ladies may tell you that size does not matter, but gentlemen in the art of burrito making that simply is not the case. 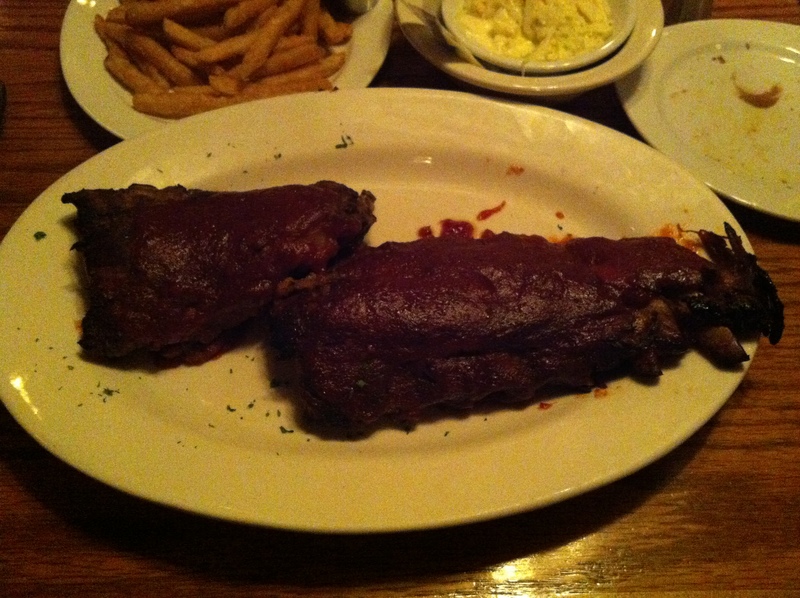 These overstuffed behemoths were cooked just right and were giving off an aroma that a cartoon character would float through the air for. Forkful, after forkful, after forkful seemed to merely put a dent in these delicious Mexican treats. All of the ingredients not only tasted fresh but they married perfectly in their flour tortilla beds. The addition of the house blended hot sauce that comes in four different flavors and the freshly prepared guacamole propels these burritos to the top of my list of Foodie Favorites. Kat is a Mexican food addict, and she would be the first one to admit that. We have Taco Bell at least once a week to quench her cravings in order to keep it economical. For close to 7 years, we even had a set day of the week that we ate at Taco Bell, called Taco Bell Tuesday, which only ended recently due to other obligations. Even though, we can quell Kat’s hunger by thinking outside the bun, what she really is longing for is a trip to the Blue Moon Café. Lorin, requested that we hit this spot when he came to visit because of the large selection of tasty vegetarian options that Blue Moon Offers. Sure, there are a dozen places in Bergen County that I could take him to get some sprouts or tofu but none would compare to the satisfaction that one gets when you are so full that might burst, but you keep on eating because you just can’t say no. We all got defeated by The Legendary Blue Moon Burritos that day, which is no small feat for any food going against my gullet. With boxed leftovers in hand we left Blue Moon that day for a total of $58.42, which is just under my target price of $20.00 per plate. The Blue Moon Café is a must for any Mexican Food Junkie in Bergen County! 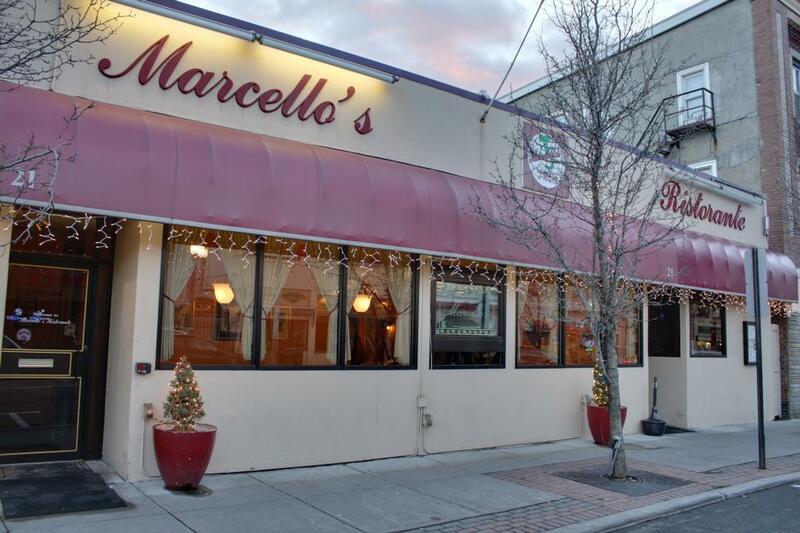 As every self proclaimed foodie in Bergen County knows, Ridgewood offers an assortment of fine dining options that tantalize even the most refined flavor palates. With that said, the menus, although ever-evolving and very tempting tend to be a tad expensive for the average Blue Collar Foodie. In order to entice my fellow frugal foodies, I have decided to open my wallet a little bit more than I would usually like to, and try some of the best that Ridgewood has to offer. There are three things to keep in mind when you are heading out to a local “5 star” eatery that assists in the dampening of the blow that the large bill may cause. The first is that you do not need to pay $12 to cross a body of water that is no wider than Route 80, secondly there is no fighting with the camera toting tourist for the last parking spot in the village, and finally you don’t have to pay the exorbitant prices the City restaurants charge you for a $10 dollar bottle of wine so they can pay rent that month. These thoughts help me get over going slightly over my normal per plate budget, and allow me to enjoy the meal without thinking of the beating my bank account is taking. 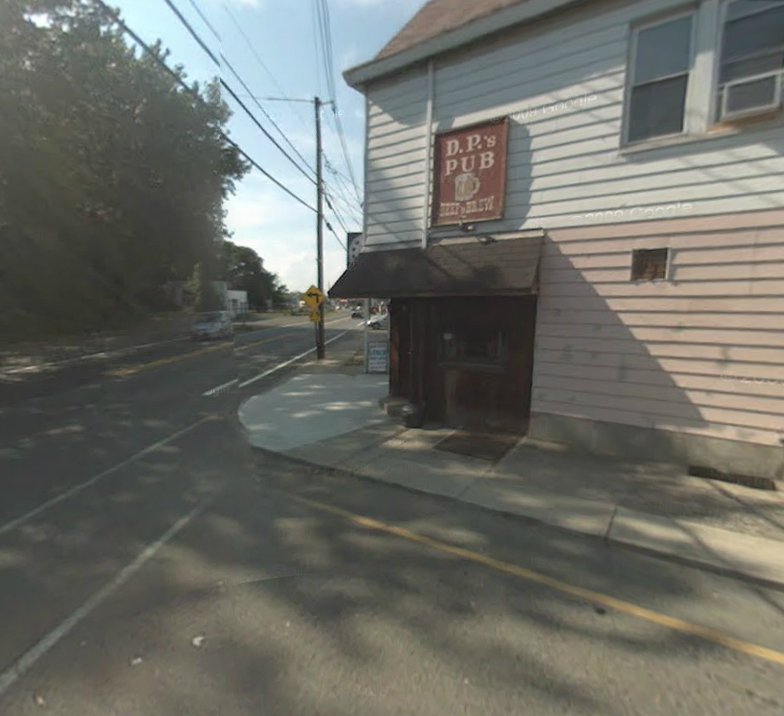 My sister frequents the establishments that line East Ridgewood Avenue and the surrounding area quite often so I asked her for her recommendations on a restaurant to review in this area. She did not have to consider her options for exceedingly long, before she told me about Mediterraneo, located on North Broad Street, which is around the corner from the main strip. 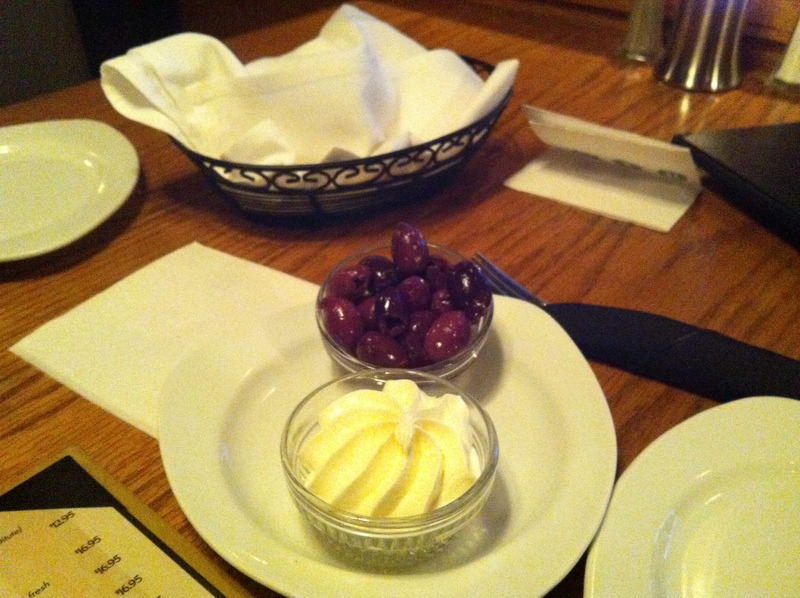 She spoke very highly of the quality of the food and the excellent Mediterranean inspired fare. 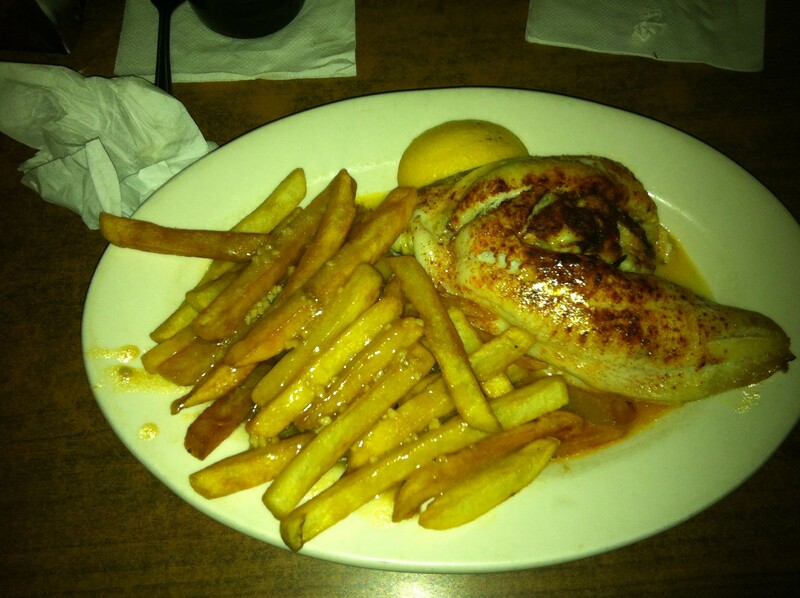 Upon searching the reviews online, and perusing the menu, it sounded like the perfect place to enjoy a sit-down meal with another couple, Kevin and Kim, that we were meeting up with for dinner, later in the evening. I failed to realize that reservations were suggested but since I got stuck at work and we were not going to arrive at Mediterraneo until 9:00 P.M., I assumed that we would not have a problem finding a table. I was incorrect, and when we arrived at the restaurant it was packed. Which is not really, saying that there were a lot of people inside, but due to the intimate setting Mediterraneo has to offer it was enough that we had to wait for an available space. 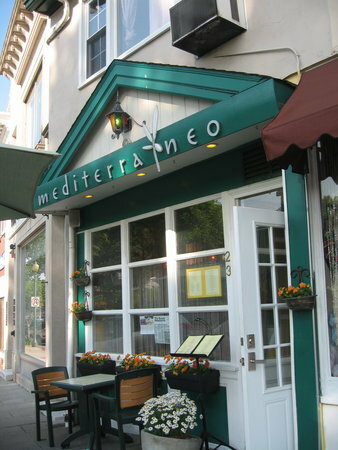 Unfortunately for us, there is no room for a waiting area inside Mediterraneo, so we were forced to wander the streets of Ridgewood for a while until a table was vacant. The hostess offered to take our phone number, which was greatly appreciated, and call us when our table was ready. With our name on the list and our number on speed dial Kevin and Kim, Kat (my wife), and I walked a few stores down and entered a Dunkin’ Donuts’ and had some coffee while we waited for the phone call. In the end, we waited approximately 30 minutes for our table to be ready, which on a Friday night is not all that bad. Once we entered the restaurant and made our way to the table, I instantly noticed the brilliant décor. The vibrant colored walls mixed with dim lighting, set the perfect mood for a night out with friends. The, what seemed like, hand blown pendant lamps were a beautiful addition over each and every table. Kat also fell in love with the mural that adorned the wall, which also looked like it was hand painted. Since I just lost at least one man point for this paragraph, and this is a food blog and not an interior decorator’s blog I will stop my rant about the appearance and move on to the more important issue; THE CUISINE. Shortly after we sat down, the waitress delivered us our menus and offered to open one of the bottles of wine that Kevin and Kim brought. With our butts in seats, wine in our glass, and menus in our hands the food journey was about to start. 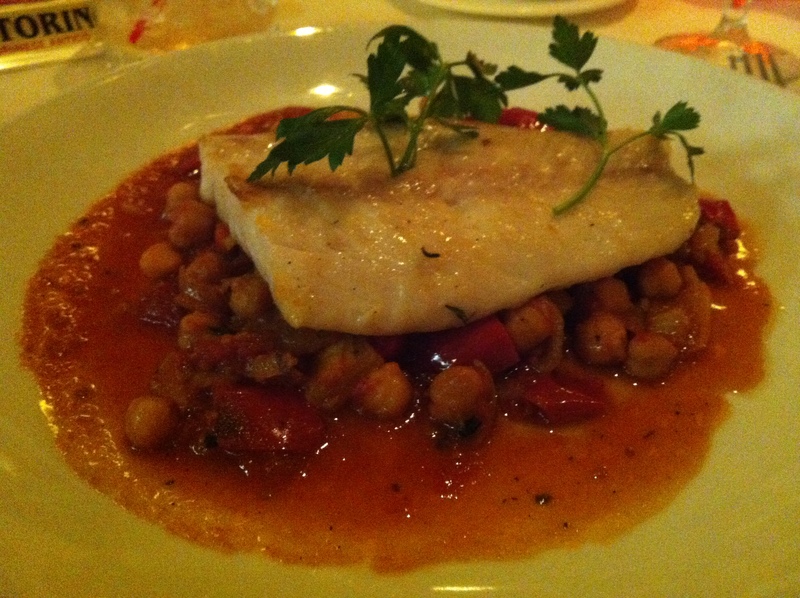 Mediterraneo, offers three separate menus, one of them is for their daily tapas specials, one is for the fresh fish, and the other is for their featured entrees. The chef changes the menus due to the availability of fresh ingredients, which creates the potential of a new experience every time one goes to Mediterraneo. I truly enjoy restaurants that use this theory to create their offerings because the dishes tend to match the current climate and seasons. Not many people want to order chili in August or gazpacho in December. We decided to order an item off the tapas menu for the table to start, which was a Pork Loin dish covered in a whiskey sauce, surrounded by fingerling potatoes and dressed greens for $9.00. 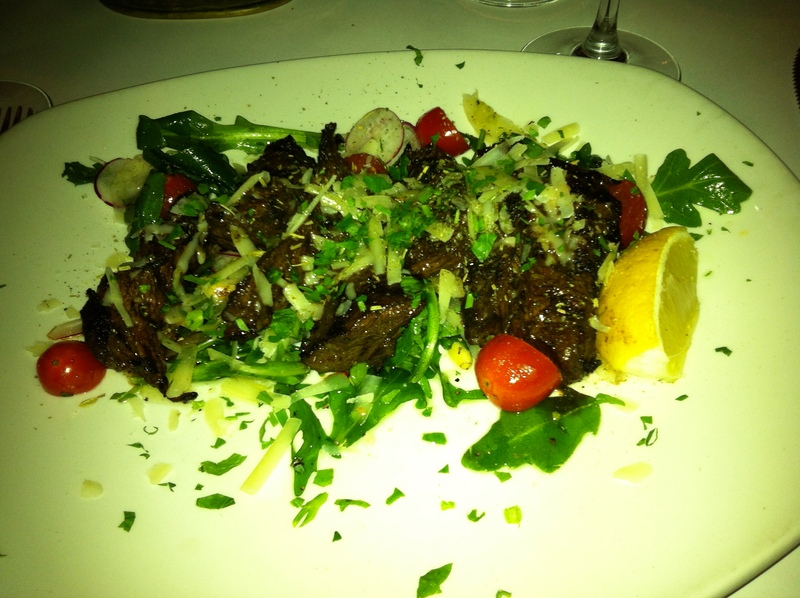 Kim and Kat both ordered the skirt steak entree with Arugula, fennel, roasted bell pepper, cherry tomatoes, shaved Parmesan, and toasted pine nuts for $23.00. 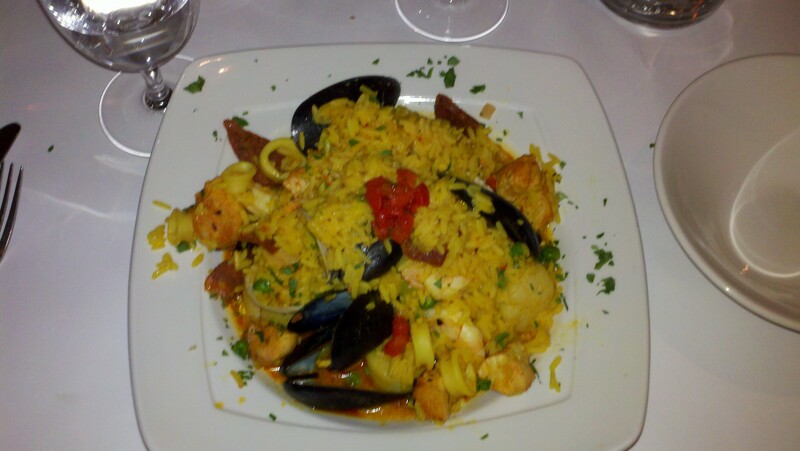 Kevin decided on the Paella Valenciana, which was described as shellfish, grilled chicken, chorizo, over Spanish style saffron rice for $25.00. 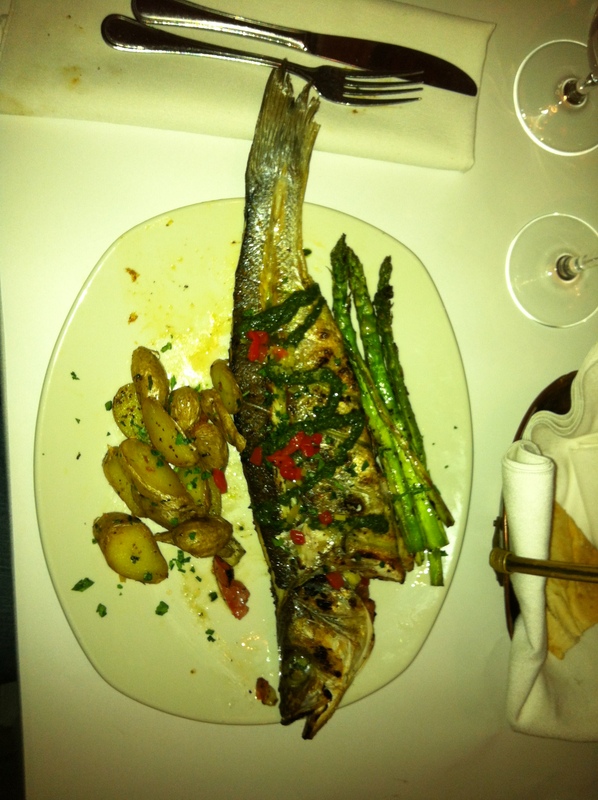 Lastly, after much deliberation — I am the slowest person ever when it comes to ordering food — I ordered the whole Branzino which was listed as a grilled whole fish, stuffed with Mediterranean vegetables, with a touch of Pernod for $26.00. As stated, these prices seem too high and even knowing all the money I was saving by being in Ridgewood instead of New York City, I still felt slightly guilty about being so uncharacteristically bourgeoisie. The feeling of guilt soon melted away faster than a slab of butter on a piping hot baked potato when the first course came out. The Pork Loin was expertly cooked and flavored. The whiskey sauce was prepared in such a way that the smokiness added just the right flavor without oppressing the delicate nature of the pork. The fingerling potatoes were slightly seasoned with a Mediterranean spice that I could not place, but fell in love with and the greens added just the right amount of color to the dish. At first when the server placed the small square plate in the center of the table, I was nervous that there was not going to be enough to go around, but this pile of meat just kept going. After the tapas course, we indulged in another glass of wine and some more pleasant dinner conversation. When the food hit our table, the smell was phenomenal, unfortunately it lingered for a bit longer than I would like before we had our first bite. The food came out slightly staggered which caused that extremely awkward moment where some people have their food and some people don’t. After several rounds of me telling people not to wait and them insisting on waiting, my whole fish came out of the kitchen and all was right in this foodie’s world. My branzino, which I had to Google when I got home to find out is European Sea Bass, was elegantly presented with asparagus and fingerling potatoes. 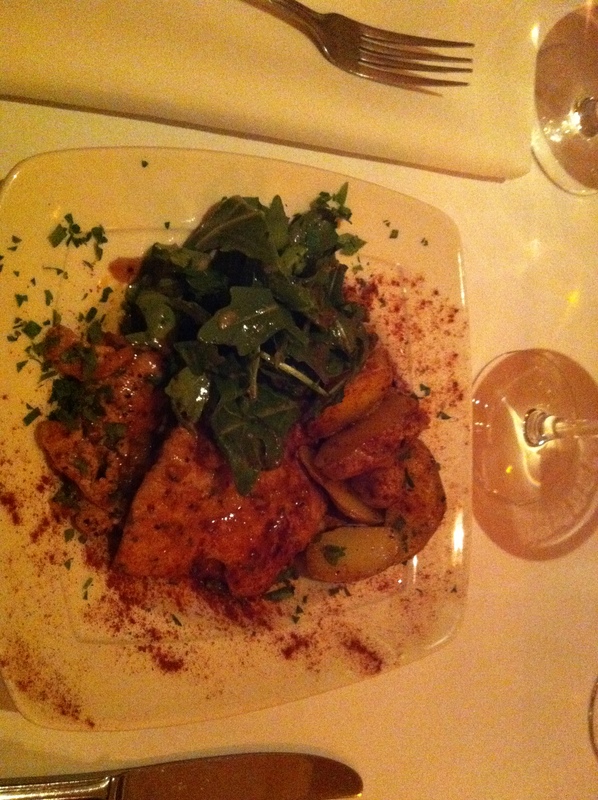 The fish was grilled over charcoal briquettes which added a marvelous essence to this already scrumptious piece of fish. The flesh of this sea faring creature was moist and succulent while the skin was crispy and delicious. I am also not quite sure if the Mediterranean vegetables could be called a side dish per se, as they were more of a co-star to this dish. I know that I have said the statement, “this is the best (fill in the food here) that I have ever had,” about as many times as I have uttered the phrase, “I am never drinking again”, but seriously folks, this was the best whole fish I have ever eaten. 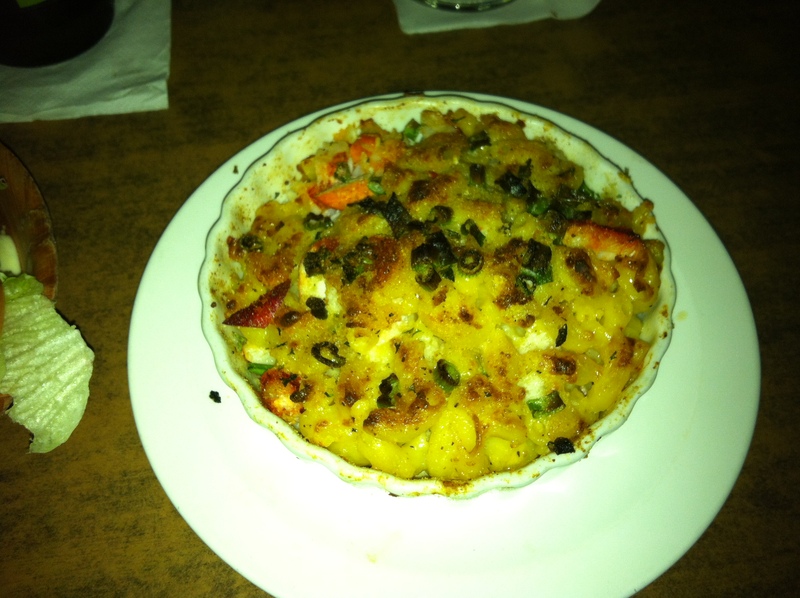 Kevin’s Paella was overflowing with scallops, shrimp, mussels, clams, and calamari. 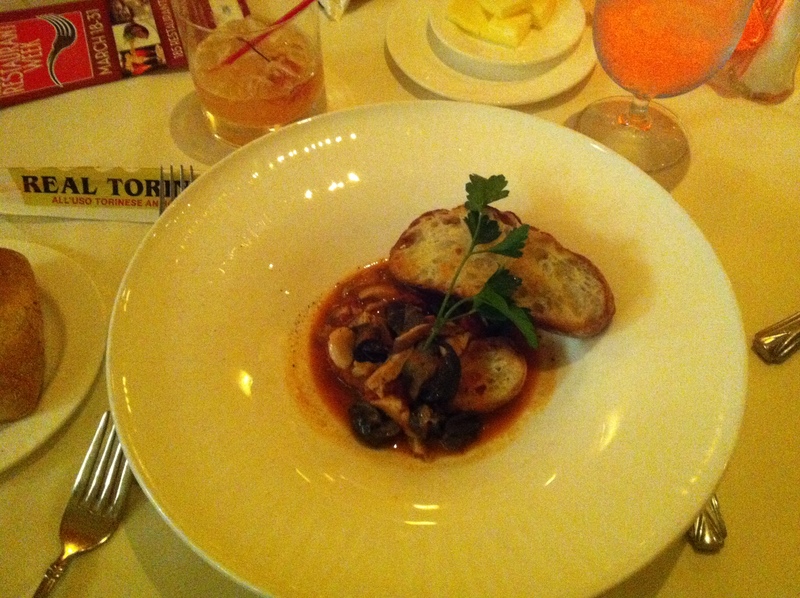 It was a plethora of tasty sea creatures that could only be described as an extremely generous portion. 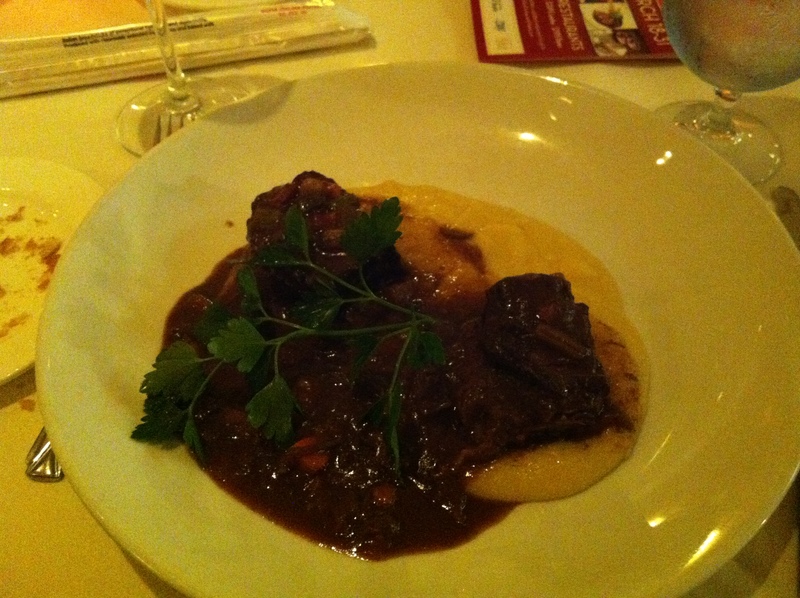 Kevin seemed to enjoy this dish as well considering he cleaned his plate and described it as a tender and tasty Mediterranean twist on a dish that can come up flat if not prepared well. Kim and Kat were raving about the Skirt Steak meal that I had to steal a small morsel from my wife’s plate, and they were most definitely not wrong to sing the praise of this delightful piece of meat. Kim was especially happy with the grouping of the sauce and the veggies combined with the steak that created the perfect ratio of star to supporting characters. 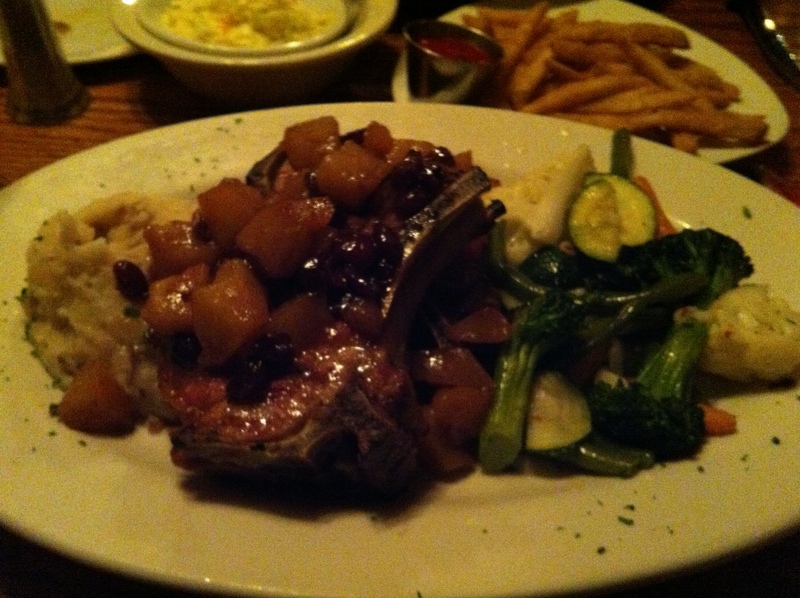 Kat described her dish as a splendid juicy steak with a complex flavor that caused her to want more and more after each and every bite. After dinner we decided to order some dessert before we left. Kat and Kim opted to share the berry tart, Kevin decided on the custard, and I went with the Baklava. I am always the type of person that tries to immerse myself into the food culture of the region that the restaurant is claiming to be inspired by. 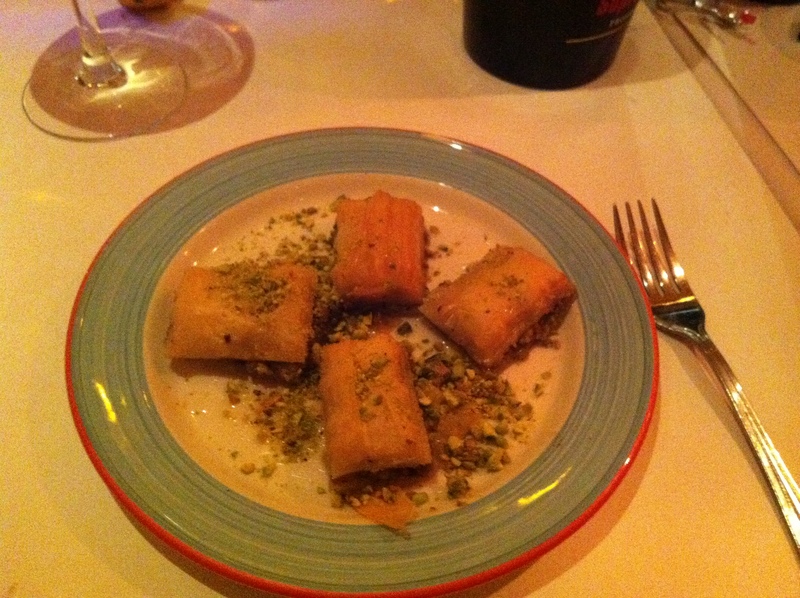 That premise has led me astray at some points in my foodie career but not this time, the Baklava was spectacular. I am sure the other desserts were also good, but I am a sucker for the classics. Subsequent to the final punch being dealt by the dessert, it was time for the judgment. The final bill was $139.00 plus tip, which brought the final bill to about $170.00. Apart from the price of the final bill, I would not change anything about this dining experience. 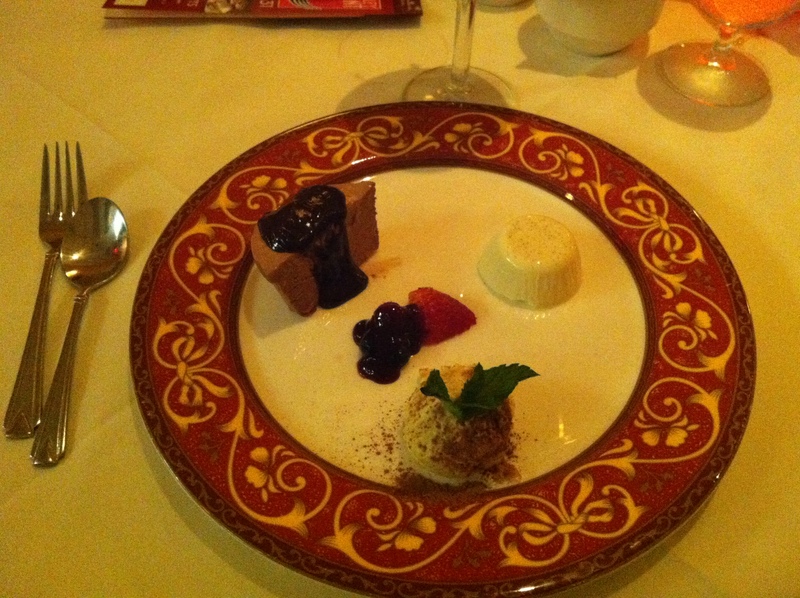 Good friends, inviting atmosphere, and extraordinary food made dining at Mediterraneo a truly enjoyable experience. As my keys are clicking and clacking away writing this review, I can hear my fellow foodies sucking their teeth in disgust about my selection this week. I understand that Chinese fare is not considered foodie cuisine, but remember the lesson we learned from DP’s last week about the book and cover, it applies yet again to Six Happiness. From the street it may appear to be just another Chinese food restaurant, but after you eat here just once, it will become YOUR Chinese food restaurant. I have moved quite a bit in the past eight years of my life, and every time my hometown changes I embark on my standard provisions journey. There are three establishments, which in my opinion, are absolute necessities for anyone that moves into a neighborhood. First, and foremost, a good pizzeria is a must, secondly one must have a bar he or she can call their own, and finally a Chinese food restaurant for the nights where cooking seems like such a challenge. Once I find these essential stomping grounds, I can then call my residence a home. Six Happiness filled the Chinese Food Void for me the first day I moved into Fair Lawn. After, an arduous day of moving into our new home, all I wanted was a cold beer and some much earned chow. Furthermore, I did not want to leave my land of boxes to acquire this desired nourishment. 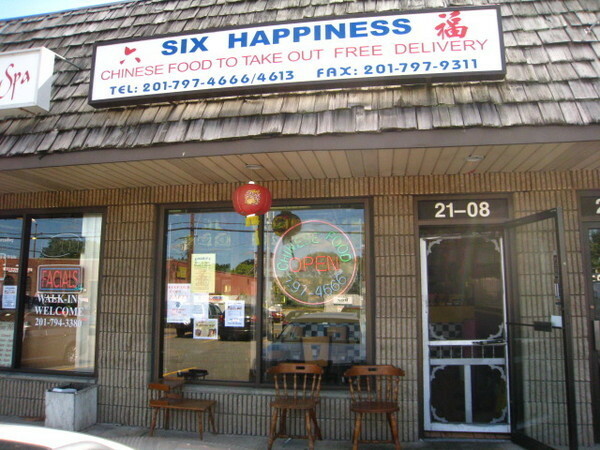 My sister, who was assisting in the move, mentioned that she had passed a small Chinese restaurant named Six Happiness right around the corner and she would venture there to pick up a variety of dishes for everyone. She returned with not only a hefty portion of delicious Chinese Food but also with a story and a house warming gift from the proprietor. Not only was every dish just as good, if not better than any other of the Chinese food restaurants that I have frequented, but once the manager found out that I had just moved in, she gave my sister a calendar for the upcoming year and wished us good fortune in the neighborhood. One does not have to be a foodie to understand that customer service is a huge part of the dining experience. Everyone has dealt with that surly waitress/waiter that ruins your dining event and taints your memory of the establishment he or she works for. The wonderful staff at Six Happiness are always smiling and extremely helpful, even during the stressful dinner rush. The female that is constantly behind the counter, greets you when you walk-in, by name if you are a regular, and can seemingly take three orders at once, while preparing a to-go order. When you walk into Six Happiness you cannot help but feel welcomed. So, did I confuse all my foodie readers yet? I know what you are thinking; Chinese food is great but is this not a foodie blog! You are outraged that I would profess to be a foodie and then choose a boring old Chinese food restaurant for my second review. Now take a breath and calm down, Freaked Out Foodie, don’t close the browser just yet, the reason Six Happiness should be on everyone’s foodie radar is not because of their General Tso’s and Moo Shu, but rather because of their simply divine Sushi and Sashimi. That is right, not too long ago, Six Happiness added a Sushi Bar to their repertoire and decided to leave all other Chinese food establishments in the area in their dust. This is not just a Chinese food restaurant peddling a few rolls made from frozen fish and soggy rice; this is a real deal sushi menu that would rival any true New York City sushi bar. From the usual suspects on every sushi menu such as the Philly Roll, the Alaskan Roll and the Eel Avocado Roll all for just $4.95 each, to the not-so standard Spicy White Tuna Roll, Yellow Tail Jalapeño Roll, and the Shrimp Mango Roll, for just a little bit extra. There are way too many exquisite specialty roll options to mention here but they do offer a myriad of choices in this category as well as daily sushi roll specials to boot. The special rolls vary in price from $8.95 to $13.95, which at first seems high, until you order one and realize that they are well worth the price. I have never had a piece of sashimi or sushi at Six Happiness that I was not content with, as the fish always tastes fresh and the dishes are artfully prepared by the sushi chefs. This weekend my wife, Kat, and I invited our guest foodie, Evan, to Six Happiness to partake in their lovely offerings. 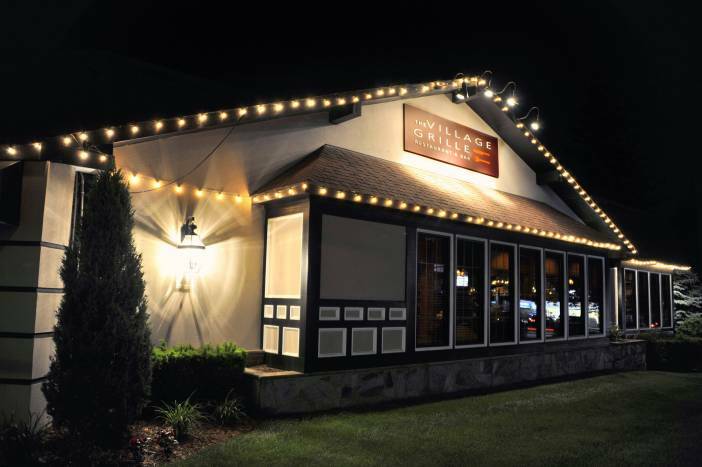 When we arrived, Evan, a foodie blogger himself, was perplexed on why we chose this restaurant out of all the foodie havens that are peppered throughout Northern New Jersey. I assured Evan that he would become a believer after dining at Six Happiness. As you enter the main door, this establishment appears to be nothing more than an average Chinese restaurant complete with the ever-present pictorial menu hanging above the counter. But off to the right is a small sushi bar which has about four tables awaiting the guests of Six Happiness Sushi. The three of us entered the restaurant and were greeted by the delightful proprietor I described above, and decided to sit at the bar so we could watch the chef’s create the magnificent dishes we were about to order. As I stated in my last blog, Kat does not eat seafood, so she ordered the Veggie Roll Combo for $8.95, which consists of a Cucumber Roll, an Oshinko Yamagobo Roll, and an Avocado roll. Evan and I decided to share the Deluxe Sushi for Two entrée, which consisted of a Rainbow Roll and a Spicy Tuna Roll plus a variety of 16 other pieces of delectable Sushi for only $28.95. Each of our meals included a rather large salad, with a fantastic homemade ginger dressing, and Kat ordered some edamame for the table as well. If the prices were not spectacular to begin with, Six Happiness is also a bring your own bottle establishment, which in turn will save you even more money. We opened the bottle of white wine we had brought along with us and awaited our salads with some light dinner conversation. 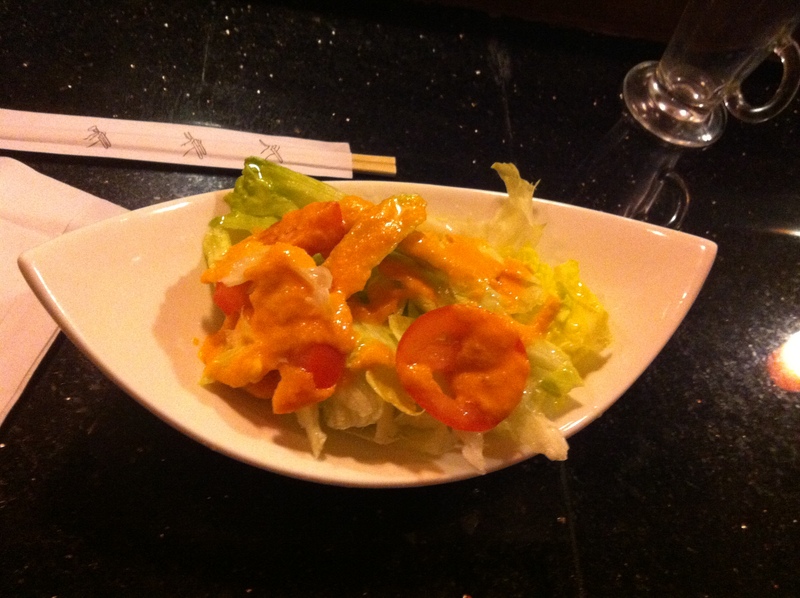 Shortly after ordering, our salads arrived, along with the edamame. The salads offer a generous portion of fresh lettuce and tomato but it is really the dressing, as stated above, that is the star of this course. The edamame are lightly salted and cooked to perfection, leaving the end product simply delightful. 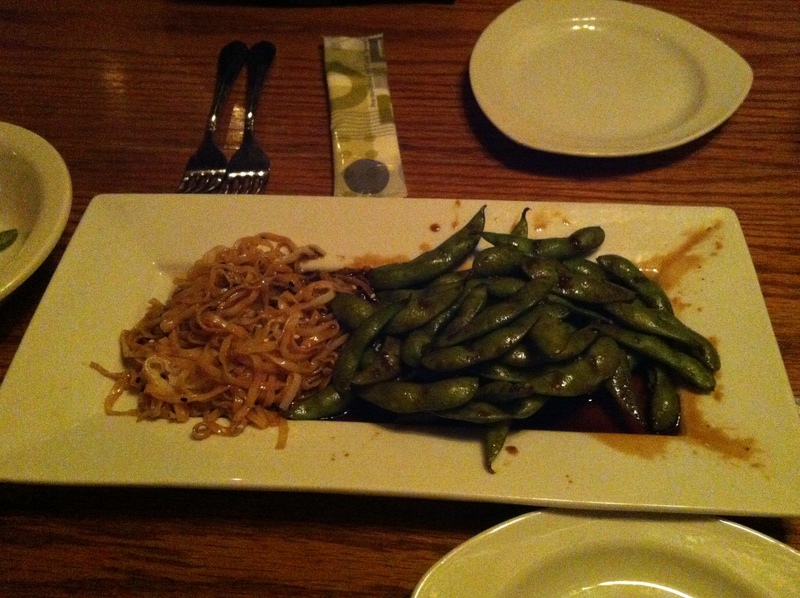 At only $3.95, the edamame is a great added treat while you await the main course to arrive. Our sushi arrived within minutes of us completing the salads and edamame. Kat enjoyed her veggie rolls as she always does. She loves the simplistic nature of the rolls they serve at Six Happiness, as opposed to some of the other local sushi places we have been to, that try to mix too many items into a veggie roll which tends to ruin them. 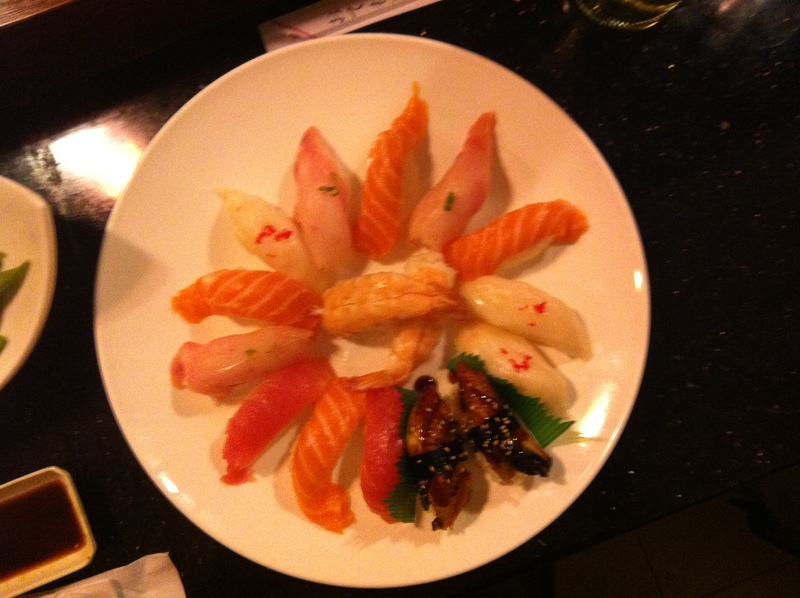 As for the Deluxe Sushi platter, I could not have been happier with our decision. 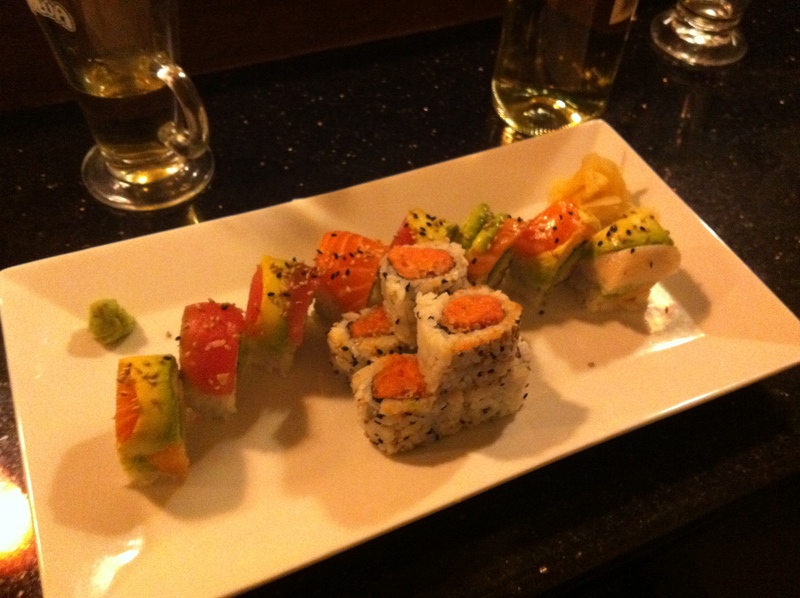 The Rainbow Roll combined an array of different sashimi which is draped over a California Roll. All the fish involved was tender and amazingly fresh, plus the chefs had expertly created this roll. The Spicy Tuna Roll not only tasted great, but also had a welcome texture that other Spicy Tuna Rolls I have had in the past have lacked. I assume that they added a small amount of tempura crisps into the roll which give it just the right amount of crunchy goodness. As we finished up our rolls the 16-piece sushi plate was served. The plate was extremely colorful and looked more like a piece of art than a plateful of food. 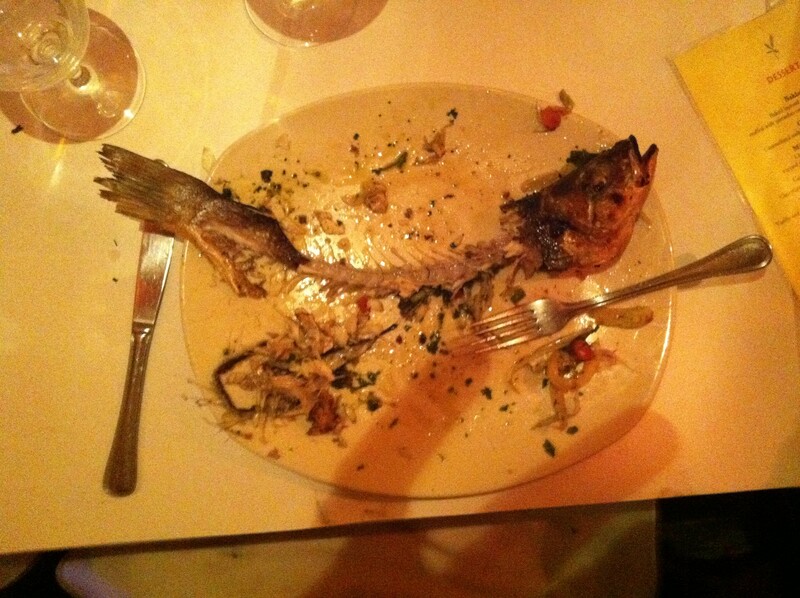 As we began to taste the variety of fish that were on the plate, one thing became very apparent; this was not two-day-old fish. We were eating fresh, White Fish, Yellow Tail, and Salmon, which tasted like it was caught this morning. Then I took a bite of the Eel and like always, fell in love with Six Happiness Sushi all over again. Most places tend to over cook their eel, causing it to be tough and chewy; this eel was extremely tender and seasoned just right. After Evan and I fought over the last piece of sushi and there was no more wine left to drink, we decided to get the check and head out. We had a coupon with us for 10 percent off, so the grand total of this fabulous meal was $39.60, which I was more than happy to pay. After signing our check and tipping the sushi Chefs we were on our way with full bellies and a decent amount of money still in our wallets. The best part of Six Happiness is that it is not only our go to Chinese food restaurant but also our regular Sushi spot as well. This is a huge deal for all the mothers and fathers that read this blog — now you can order sushi for you and pork lo mein for the kids. That is right, you can mix and match your order and they will deliver it directly to your doorstep, free of charge. Six Happiness not only delivers your food, but they also deliver excellent customer service and high quality eats at Blue Collar prices. Ten years ago the word foodie was not defined, much like Bling, Tebowing, and Puggle. 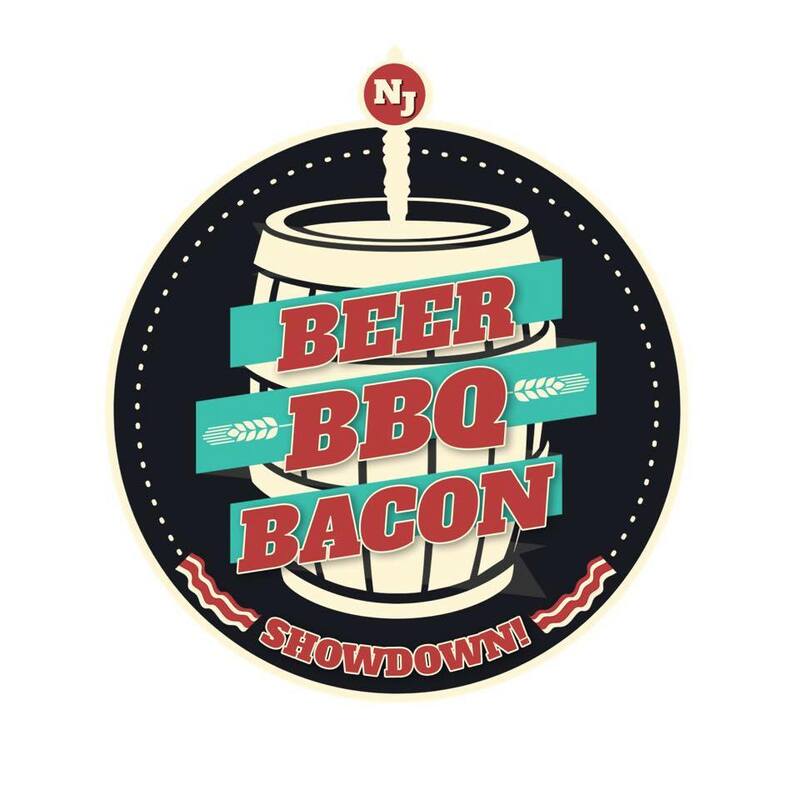 Well as Bob Dylan once said, “The times they are a-changin’.” Now, as food connoisseurs, we can turn on our televisions and watch a myriad of television channels devoted to food and food culture alike. From Diners, Drive-ins and Dives on the Food Network, which follows Guy Fieri as he visits America’s most interesting and unique restaurants, to Bizarre Foods on the Travel Channel, which celebrates the out-of-the-ordinary cuisine and characters that are found all across the world, these programs have given birth to a new sub-culture of society known to the world as “Foodies.” These individuals travel not only the United States, but to many different countries in search of the best and most peculiar food stuffs they can find. I would love to say that I am a true foodie, but to be honest I am not. I do not have the capital or the time to travel the state, let alone go trekking across the globe to find the best burger in the universe. I do not have a trust fund or a television network that will sponsor my gallivanting, but I still yearn to experience the best cuisine my wallet can provide. I am just an ordinary guy with average friends that all share the same hobby. We all love food! This thought gave birth to an idea, which in turn created this blog. Although, my friends and I do not have the money to afford the lavish and wondrous meals that the traditional foodie would partake, we decided that we could create a new subsection of the foodie culture deemed the Blue-Collar Foodie. We cannot fathom spending $100 a plate for 4 ounces of braised Kobe Beef and then leaving the restaurant to grab a Whopper because we are still famished. What we do enjoy is stumbling upon a diamond in the rough that offers fantastic food at a fraction of the New York City Prices. As Blue Collar Foodies we will scour our very own neighborhoods to find the finest restaurants, cafes, bistros and bars that offer superb food and drinks at reasonable prices. Furthermore, not only will we taste their offerings but this blog will serve to inform the community about what we have discovered hidden in our own back yards. This is the first and only blog that will be written in this format, from this point on the Blue Collar Foodie Blog will act as a review-type blog, with pictures, menus, experiences, and reviews of food establishments in the area. Stay tuned and please leave comments about spots in your neighborhoods that you would like us to feature on this blog.